A team of MK Dons Legends raised in excess of £10,000 for the Sports and Education Trust by taking on, and thrashing Leicester City Legends earlier this month. Events Managed brought together a team of ex-MK Dons players including Luke Chadwick, Jon-Paul McGovern, Sean O'Hanlon and Peter Leven, looking to beat their contribution of last year by targeting £10,000 which will help benefit many of the 50,000 people the SET engage with each year. There was also a surprise visit from ex-Club Captain Paul Mitchell who updated us on his current role with RB Leipzg. 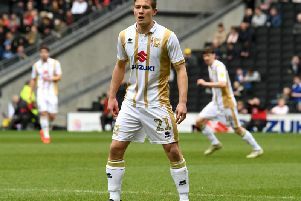 The match, sponsored by Brioche Pasquier who also sampled their great range of ‘PITCH’ pre-packed brioche on the day, was exciting from start to finish as a strong MK Dons team took a strong lead of 7-0 in to half time. The relatively young Dons side with an average age of 38, pushed on for the second half with a final score of 14-0, with goal scorers included Aaron Wilbraham, Drewe Broughton, Man of the Match and Manager for the day Izale McLeod and a hat trick from Scott Taylor amongst others adding to the total. Marketing Manager, Melissa Bentley from Brioche Pasquier explains why they partnered with MK Dons Legends. "We feel that the Legends game is a great concept that brings together fans and players for a day of football that all can enjoy," she said. "After the success of last year we saw great potential in the game and saw value in the opportunity to be involved as well as supporting the local football club."